Multiplayer gaming wouldn't be what it is today without the Nintendo 64. It's strange to say in hindsight, considering the console's antisocial streak. In 1996, it was the first system to make four-player gaming a default option, paving the way for couch-filling classics like Super Smash Bros. and Mario Kart 64. But typically, when the screen broke into fourths, the N64 made a party foul. Before laggy internet games and Red Rings of Death, the common geek's plight was the frame rate -how smoothly a game ran. And as one of the earliest 3-D consoles, the N64 often buckled under a quadrupled workload. Star Wars podracing was more like plodracing when friends joined in. Even legendary spy shooter GoldenEye 007 could look like a flipbook with four players sharing the screen. Why, then, do fans still clamor for GoldenEye's re-release on modern consoles? The rose-tinted glasses of nostalgia are clearly at work here - and modern game makers may have forced us to put them on. In spite of Ã¼ber-powerful game systems, local multiplayer is falling by the wayside. It's not dead - how's that Wii, Grandma and Grandpa? - but these days, too many top-tier games are scrapping options for extra buddies to play in the same room, on the same couch, like we did for marathon sessions of GoldenEye. 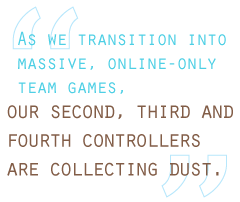 As we transition into massive, online-only team games, our second, third and fourth controllers are collecting dust. Stunt-racing masterpiece Burnout Paradise gets all the little things right. With fewer loading pauses, the game doesn't halt between races. Frame rates are smooth. Paradise's developers have even given away bunches of free, downloadable bonuses. These details are what we gamers beg for from so many developers, but I still have a bone to pick with Paradise. In its multiplayer cooperative mode, players drive together through the game's sprawling city with a variety of tasks: rip donuts in a particular parking lot, then set up a super-stunt where everyone crashes into each other in mid-air, etc. Wild stuff. Trouble is, you can't roll co-op with friends on the same screen. Everybody needs a copy of the game, a console, a TV and an internet connection. Stubbornly, I begged a buddy to get the game so we could enjoy these modes together - they seemed fun in early tests. Not so much. When he got confused, I couldn't point at the screen and gesture. My taunts were relegated to fuzzy shouts over a cheap headset. Worse, when we drove from task to task, often for up to two miles of virtual distance, it felt hollow and boring - why couldn't we spend this downtime riffing on the same couch? Adding more players to round out our co-op team didn't help; rather, we were auto-grouped with rude, disagreeable or silent guests. It's neither the first nor the last game to leave couches cold in the latest gaming generation. Shooters like Gears of War 2 and Resistance 2 top out at two players on a single console. Sony's latest mega-shooter, Killzone 2, won't make room for more than one player per PS3, in spite of its battle modes focusing specifically on four-player "squad" groups. Even the most cooperative of all co-op games in recent history, Left 4 Dead, requires you to play online to max out your four-player squad.